Lucy's Cards: Lucy's Cards - Challenge 12 and Challenge 11 winners! Lucy's Cards - Challenge 12 and Challenge 11 winners! OK, so I have too many buttons. Anyone else a button hoarder? So, create a card using buttons. Link me to your blog post or photo using the inlinkz tool below. Remember to link directly to the card. Challenge closes: Friday 23rd July. Loved seeing all the beautiful birdies. Thanks so much for entering everyone. What is it about buttons (my husband has asked me that a thousand times: "what do those MEAN?") So this will be a fun one. Thanks for choosing my card last time!! And congrats to Lynn and Stef - beautiful! Lucy, Thanks so much for choosing my card! Congrats to Lin and Stef too! Beautiful creations! congrats to all winners! beautiful cards! Hooray for the winners! Buttons? Oh yea, I have way too many...May have to try this challenge...sounds fun! I played along! Love using buttons!!! Your blog and cards are beautiful.I'm so glad I found it. I LOVE buttons! !Perfect challenge for me. 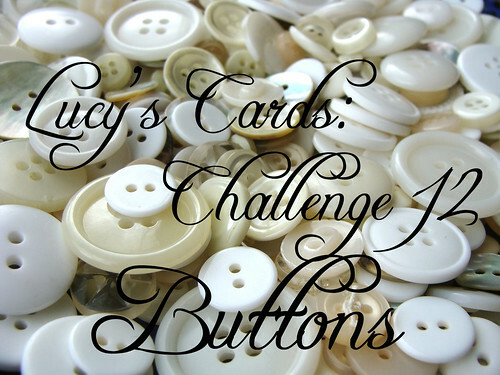 Love your cards Lucy, thanks for the chance to win some buttons. Hope my link has worked! I know I'm late--but I didn't know how to post my card without people seeing the challenge before it was time! I love playing along with your challenges! !